YES, YOU CAN GO HOME AGAIN!! This past weekend was my high school reunion and it did not disappoint. At my age I am truly secure with my insecurities and so I could relax and enjoy this reunion. We had a huge class—over 1200 when we graduated. While our attendance was low relative to that big number, I still never got to see everyone or give them a hug. Once a Cavalier, always a Cavalier. 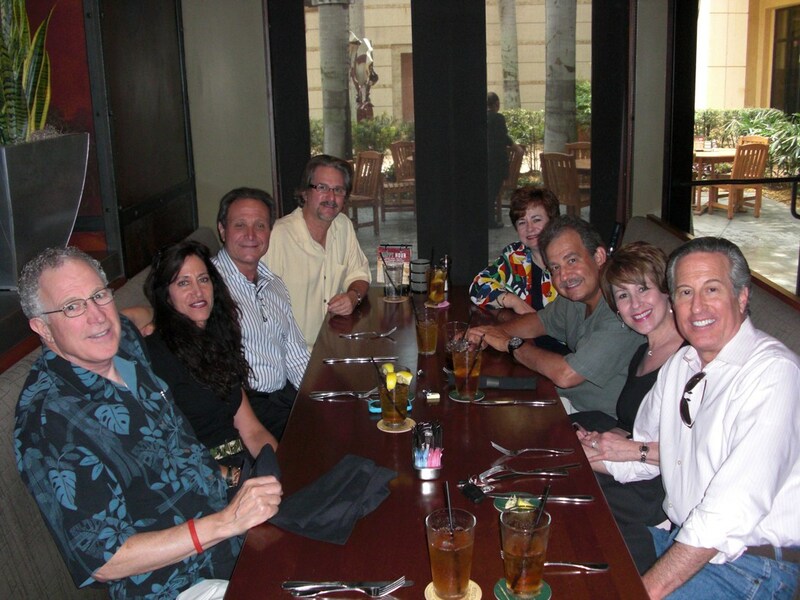 I started the weekend with lunch with my old friends—my guy friends: Ron, Mike, Jeff and Jack and their wives and my sweet husband. It was a great way to start out and we got to spend some quality time together. It is these guys that I credit much of my success as a business person. I just never knew from discrimination. These special friends never treated me differently—to them I was a person and so that is how I have always thought of myself. Yes, I was a girl and I am a woman but to them that was neither here nor there—I was a friend. Lunch at Yardhouse on Friday--so much fun! My friend Mike Davis, now a doctor in Houston, asked me what I think was a key aspect of my growing up that made me so successful and I said it was no doubt my friends. I have always been blessed to have many wonderful and different friends. They have helped add greatly to the person I am today in so many ways. Friday night was a casual party and saw some great friends who were not able to come to the Saturday event: John Kemeny and Maxine Kamin to name a few. We had a great chat and I hope it is not a long time between the next visit. Mrs. Adams and Ms Reitsma also attended. Saturday, my best friend ever, Connie Knight, an artist, and I had a wonderful lunch at The Biltmore. Just two girl friends together like the old days. We talked about family, friends, books and travel. Hopefully she will come and visit me soon. 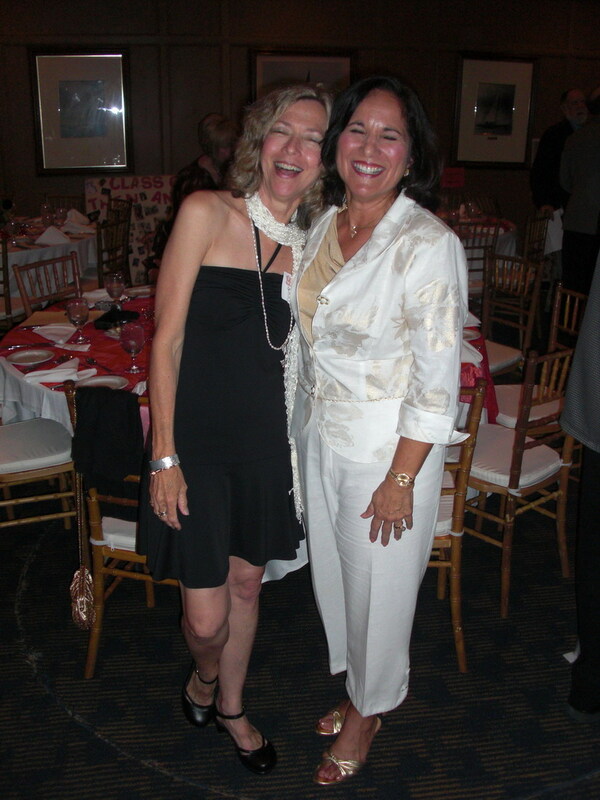 Connie and I met in the 5th grade and we have stayed in touch all these years, through thick and thin. Today we can proudly say we have been friends for 50 years! Saturday night was the fancier party and more people attended including some of our former teachers—Jeff Rosinek and Dan Finora. My two senior homeroom neighbors were there and we took a pix—Kaplan, Kasselman and Katzen..in alpha order! Alan Kaplan is a dentist and Joani Katzen Stein is a teacher. Both of them live in the Miami area. 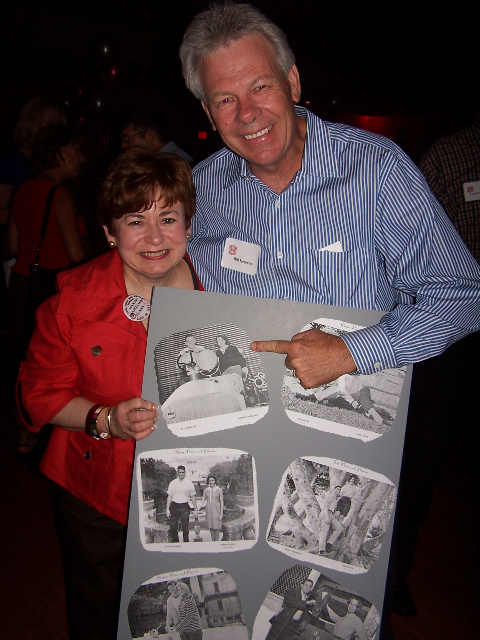 I was also happy to see so many friends who have scattered farther away like Bill and Sally Kerestes who also dated in high school, Ward and Mary Julia Hiss who live in Georgia and Knox Rodgers and Frank Kendricks, Rocky Young and Tom Williams, Pam Peterson, Kitty Peters and Anne McDonald. Many names too numerous to mention but all who hold a special place in my heart. We were the Pepsi generation and we still have much to accomplish. We created bear centerpieces for all the tables themed to our high school years: surfer boy and girl, Harley, prom, football, prepster and hippies too. The bears were a hit! Thanks to all of the reunion committee—Daru, Alex, Art, Anne especially for all you did to make this event happen. It mattered. To all of you who might be reading this and think a reunion is a joke or not worth attending, think again. In order to truly move forward, you have to know where you have come from and appreciate your past. It should not be erased but rather it should be built upon. Hugs to all my Cavalier classmates and teachers—you will always be in my heart! Thanks for being a part of my life for all these years. This is a big weekend for me. I am attending my high school reunion in Coral Gables, FL and I am very excited. I am one of those people that loved my childhood—I was very blessed in so many ways. My family was of very simple means but we had a good home in a great neighborhood which allowed me to attend incredible schools and make lifelong friends. I have even a friend today that I met in kindergarten—Abby Kolber Ross. Her son graduated from Wash U Law School last year and we were able to reconnect. I had dinner with her and her husband David last month when I was in Miami for the Silver Knight Awards. Joining us for dinner was Jeff Rosinek and his wife and we had a great time. Jeff was my high school government teacher and what an incredible teacher he was! I was very lucky to have guy friends as a young girl and it is these particular friendships that had a huge impact on my sense of self. Mike Davis and Ron Hagen were two of my best friends and I think my image of myself as a viable and credible person was molded by the fact that we were such good friends. They never treated me like a third wheel or a dumb girl but as a friend, an equal. Mike and I were friends since the 4th grade and Ron joined us when we went to junior high. We had great times at each others homes with other friends like Jeff Apple and Laurie Ross. We often talked into the night via telephone. For the life of me I cannot remember what we had to talk about because we had seen each other at school but we never seemed to run short of thoughts or dreams to share. Mike is a doctor in Houston and Ron a dentist in Miami and Jeff a movie producer in Los Angeles. We have all had our share of ups and downs –mostly ups I am glad to say, and while we don’t see each other often, we are able to connect immediately when we do reunite. I can’t wait to see them and spend time with their wives too. My best, best friend Connie Knight will also be there. We first met in the 5th grade and have been friends ever since. Connie lives in NC now and is an incredible artist. She has two grown children. Her daughter Ariel looks exactly like her mom! It is pretty amazing when your friendships can span nearly 50 years. Now Facebook is making it easy to reconnect with old friends. That to me is the best party of Facebook—being able to reconnect! Some people think no one will ever know how they really are so they can be a bully and act like a big shot. I do think the virtual world, one like Buildabearville.com, is a place to relax and pretend and have fun. Why not pretend to be a better person, a more charitable person than you are in the real world, a better friend, a harder worker, a better sister or brother or son or daughter and see how much can trade off to your real life. Set even higher standards for being true to your word. Imagine if all the online friendships that were forged were because we wanted to become better people, not jerks or bullies? Maybe the virtual world behaviors we can create will stamp out people who want to be mean because random acts of kindness will be so much easier and fun and rewarding and maybe contagious and habit forming. I look forward to that day. Thanks to all the BEARY good citizens of BABV who set a high standard for being good citizens and good friends real and virtual! You are currently browsing the Maxine Clark's Blog blog archives for June, 2009.